So I just noticed that most of my reviews on the comic read pile posts have been somewhat positive. Meaning, I’ve yet to really review or talk about any series that I thought just stunk up the joint, like spoiled meat in a dirty diaper. That all changes with today’s entry, Dynamtie Entertainment’s “Masks” series. The worst part is that I really wanted this series to be good. 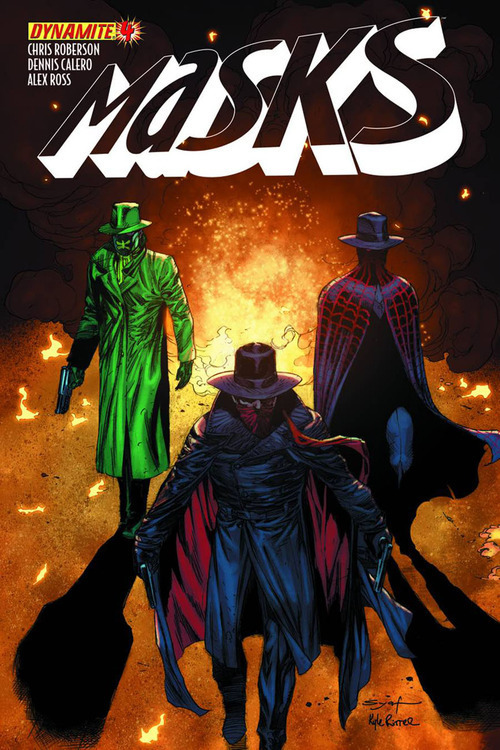 I was uber pumped when I first caught wind several years back that they were gonna make a book that teamed up both the Shadow and the Green Hornet, as well as a number of super heroes from the pulp era. I thought it was a no brainer that I’d be loving this book from start to finish. Oh how I was wrong. Dynamite has been for the most part hit or miss for me typically. They put out some really great series like the original Lone Ranger or Green Hornet: Year One. And then in almost the same breath, put out something suckatacular like Flash Gordon: Zeitgeist. I’m automatically drawn to this company because they do make comics about 30s and 40s heroes and man o man do I dig on that, but really I’ve been burnt so many times by that premise that I’m starting to feel like a moth at the flame. Worst of all, the Dynamite books have been the ones most consistently purchased by me months in advance through pre orders, so I’ll already be on the hook for like 6 issues before I can really stop buying the series. Therefore, because I’m purchasing a book on the promise of something good, it really blows when it fails to deliver. Masks definitely started ok. The first issue was fantastic with classic Alex Ross art doing a lot of these pulp characters justice with a strong sense of realism and timeliness. 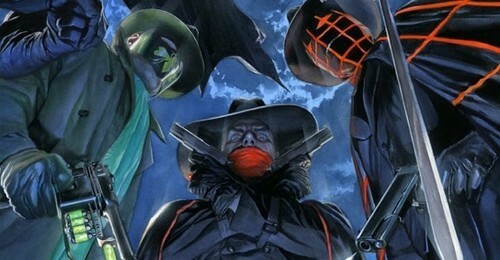 Plus, for the most part, it centered on the interesting team up of the Green Hornet and the Shadow. There was some fantastic chemistry displayed in those first pages showing how the two similar yet strikingly different heroes operated and how much they could benefit by joining forces. I think if the series would have stayed like that with just a team up of these two heroes, I would have enjoyed it a lot more, as the story would have had more room to breathe (but I’ll get to that more in a minute). Instead, within a couple more pages, we start what’s ultimately the downfall of the entire series: Exponentially increasing the amount of heroes. I mean, seriously, they are pulp heroes. Most of them are cut from the same cloth. There’s not enough differences between them to really avoid duplication of efforts. First, The Spider joins in on the little crime fighting love fest, and even that this point, I said “Ok, the Spider is just a Shadow clone, so that’s a bit redundant in terms of storytelling, but I’m willing to let it slide, as long as he’s given a different feel than the Shadow.” Which to the credit of the writers he was, as he was cast at least originally as almost a bridge between the characters of the Hornet and the Shadow, someone that took parts of both and supplied some middle ground to the team. So again, given this dynamic, I let it slide, so long as the team was just Spider, Hornet, Kato, and Shadow. But no, by issue 2, they are introducing even more characters like Miss Fury and The Green Llama..or whatever he’s called, and they aren’t even dealing with the main group. Then comes Black Terror, and the Black Bat…so two dudes with the same color theme..again because we needed two of them..Oh and Zorro..can’t forget Zorro, because a 1930s Zorro makes sense. And they don’t even stop there as they even refer to more pulp heroes like The Clock…and…its obviously becoming apparent that they really don’t care as much about the plot as just shoehorning in as many pulp hero placeholders into this thing just for the sake of doing it. And that’s the real problem. Even though, the plot is pretty loose to start with what with some werid ultra facist political party taking over the state of New york and thus our heroes just have to clobber jack booted semi Nazis, it’s still not helped by the fact that there are way too many heroes all pretty much doing to the same thing to the point were it becomes a literal clusterflock. Nobody seems to really care what’s going on, and the issues just seem to meander from one fight scene to the next. I mean there’s supposed to be some sort of Ozymandias type ending where the big bad turns out to be someone we thought was a good guy, but by that time, there were so many poorly defined heroes running around that any dramatic effect was completely gone. Plus on top of that, the really great Alex Ross art stops after issue 1, with only covers done from that point. And I think that’s really what sums this entire series up. Great First issue followed by increasing bad confusing stuff after. It’s like the tone between issue 1 and issue 2 was completely lost and is instead replaced by…well…nothing. There’s no tone for issues 2 through 8. Just a collection of old timers running around without any motive or strong characterization. It’s really a shame. This series could have been really great. 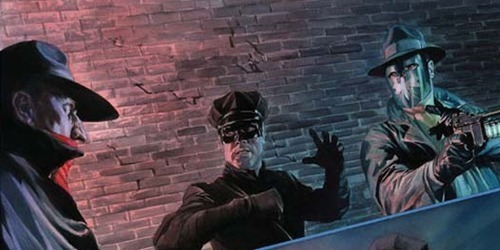 They could have made an 8 issue arc about the Hornet, Spider, and Shadow fighting Nazis together with Alex Ross art. That’s the bill of goods issue 1 promises. But it seems like that was just done to get the confusing mismatched junk of a series’ foot in the door before showing its true colors.